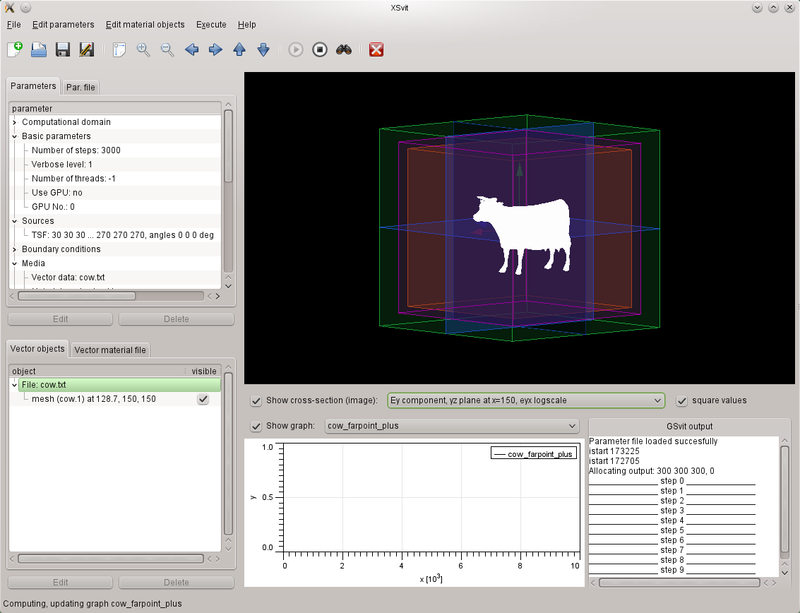 into GNU GPL based open source software. This process is rather slow, at least for some of the algorithms, but seems to be converging. Documentation was switched to DokuWiki system. Version 1.9-rc1 was released. User interface was improved. Parameters can be changed in a separated window instead of dialog windows. Version 1.8.2 was released. It is mostly a (huge) bug fix release. Check the download page. Please note that the link for download of Windows version wasn't updated and it was still connected with the older 1.8 version. This was corrected now and the link is connected with the newer 1.8.1 version. We are sorry for this! Version 1.8.1 was released. It is a small bug fix release. Versioning was changed to three number format. Check the download page. Version 1.8 was released. Piecewise Linear Recursive Convolution and Auxiliary Differential Equations method were added. Many bugs were fixed. Version 1.7 was released. One small step for mankind, one giant leap for GSvit. Version 1.6 was released. It is the first release with XSvit - parametr file viewer and GSvit launcher. Bugreports are welcome! A bug fix for Windows OS was released. The mising libraries bug was fixed. Version 1.5 was released. A bug in tetrahedron loading was corrected and layered TSF and layered focused TSF were implemented (CPU only). Version 1.4 was released. Optical force calculation was introduced and the Debye and critical point model media now work on GPU. Version 1.3 was released. Significant speedup on CPU and a slight speedup of some algorithms on GPU was achieved. Version 1.2 was released. Focused light source was added and focused light source and periodic NFFF were implemented on GPU. Version 1.1 was released. Periodic near-to-far field transform was added and many bugs were fixed. Version 1.0 was released. Generaly, a bug fix release. Version 0.99 was released. Several new data inputs were introduced.